Robin Lopez brings positive energy to locker room through...Britney Spears? The Bulls have tried the three ball, coming just short against the Cavs, the defense and just missing against the Spurs. Maybe all they needed was Britney. Someone to watch over them. With Britney Spears looking down on the Bulls locker room, the Bulls are undefeated. A framed picture of the pop diva with a precocious smile appeared Thursday at the top of Robin Lopez’ locker space, and nothing but good things happened otherwise. “We’ll always have Britney looking down on us,” assured Lopez. It seems when the impish Lopez was leaving the Air Canada Centre in Toronto after the Bulls opener last week, he spotted a picture of Spears on the floor. Cast away without concern! 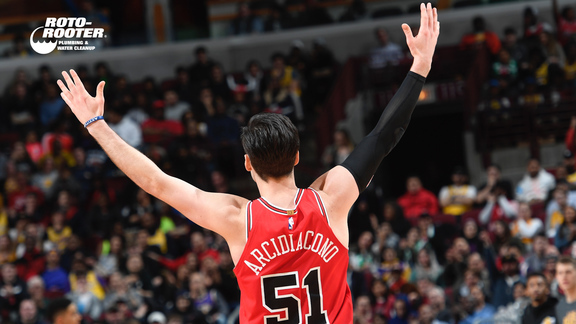 Imagine, the icon and singer of In the Zone, which the Bulls sort of were Thursday with their 91-86 victory over the Atlanta Hawks, the Bulls first win of the season. Britney appears smiling down on the Bulls players. The Bulls lose a fourth quarter lead, trail and then pull away for their first win. “I found the photo on the floor,” Lopez said with almost disbelief in his voice. You get the sense this may be why Americans are so suspicious of foreigners. To treat Britney that way! “I was with Quincy (Pondexter), we were pleased with the find,” said Lopez, always the great teammate and eager to share credit. After all, Pondexter had not played in two years with serious knee injuries. Who more than he deserved to be associated with a Britney Spears rescue? Lopez then went on to list some of his Britney favorites: Baby, One More Time; Ooops, I did it again; In the Zone. Though Lopez was horrified when someone asked him if he also liked Email My Heart. As Britney would say about those Bulls against the Hawks, Gimme More.